About I've been on holiday at my favourite place and took the oppurtunity to practice some sunrise shots. I've also finally started using RAW capture and ND Grad filters, and have already noticed a huge improvement in my seascapes. Cracking shot Ann, good colour, detail and composition! I like it. A CC image and I just can't think of a way to improve it . . . wellllll . . . perhaps a 1mm black line border could be added. Yeah . . . IMO, THAT would improve it!! I did look into the crop AJ suggested . . . didn't care for it . . . I also looked at lifting the lower crop so the fence line on the lower right goes out at the corner of the composition . . . didn't care for it either. Looked at your image again . . . and can't imagine why it needs to be cropped anyway! Hi Ann! You've CC'd this one, so I feel my critique should be a little more in-depth. But I'm struggling a bit here... It's just not grabbing my attention, and I'm not sure why. It's the sort of composition I like, the colours are great, but... it just seems to be lacking a certain oomph. Cropping the empty sky at the top might help, and perhaps offsetting the composition a little by moving over to the right a bit. Another glorious beach shot..we're going in about 4 weeks...maybe you can be my mentor? 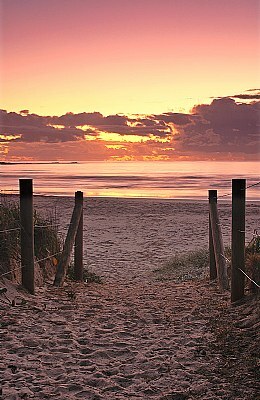 Beautiful colours and a great lead in with the fence on either side opening up to the beach and that gorgeous sunrise! Well done, Ann! Beautiful shot Ann, great colours, excellent dof and focus, Very nice composition. very good use of NDG filter. Very good work.